Law school = massive amounts of studying. No way around it... unless you want to fail. Everyone is different so some people prefer to study only at school, some study in coffee shops and some study only at home. Personally, I am a homebody so I primarily study at home. Thankfully, my husband and I have a 3 bedroom house so I was able to turn one room into an office. It has taken some time but I finally feel like I have a study space that is functional, aesthetically pleasing and works for me. It is where I do 90% of my studying and it is a space where I feel comfortable and inspired to work. Here are my biggest tips for setting up a functional home study space for law school. Unless you want to go almost blind, you need some light in your study space. Natural light is by far the best but all those night owls out there need to see too so artificial light is necessary. I have a wall of windows in my office and my desk is on the other wall so the light bathes my study space. When the sun goes down, I have a desk lamp and 100watt bulbs in the ceiling light to brighten the space and eliminate eye strain. I have an old desk from my childhood room that I painted to give a facelift. My office chair is the basic variety from Walmart or Staples but it does the trick. I also have extra bookcases, a file cabinet and a trash can in my office area. There is so much paper, books, supplies and various items required in my study space... it just never seems like I have enough space for everything. I have two bookcases, storage in my desk, a file cabinet, an organizer on top and a hanging file organizer. Even with all of this, sometimes I struggle to stay organized and need a little extra space. I have a small folding TV table that I will set up next to my desk when the need for more space arises. 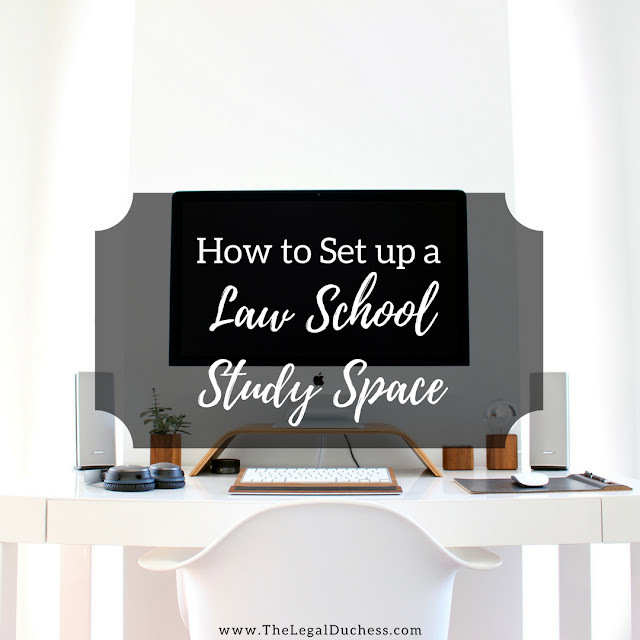 Some of the must have supplies in my home study space are: a 3-hole punch, a stapler, printer, tape dispenser, desk lamp, highlighters, pens, pencils, book stand, sticky notes, legal pads, power strip, calendar and cork board. See more of my must have school supplies and why here. I am big on staying inspired so I have a few inspirational quotes and such in a gallery format on the wall above my desk. I think it is important to do what inspires you; some people prefer a clean, minimalist space for optimum productivity whereas I like some color, knick knacks and inspiration all around me. I also have a small plant because I find it calming. My color scheme is lots of white with pops of turquoise because it is a soothing color. The more organized I keep the space, the more productive I feel. This blog is really great. The information here will surely be of some help to me. Thanks!. Tashina Lovitt I have bookmarked your blog, the articles are way better than other similar blogs.. thanks for a great blog! Setting up your investigation condition The initial step is guaranteeing http://best-baby-items.com/stages-of-quality-research-paper-writing.html that your place of study is satisfactory for your necessities. This will also be the spring of all the efforts http://thessayist.com/ you will do to make a difference in your study.